Put on your flapper dress and start planning your 1920's party. The Roaring 20's were such a fun time and your party theme can be just as wild and crazy. Sip martini's while playing Canasta or Yahtzee. Another fun idea would be to set up a silent movie themed photo booth. Just be sure to add some twinkle lights for decorations. You can also create a 1920's party for a Bridal Shower with the "Purse Game" or Bachelorette Party. Of course you're going to need party invitations too! 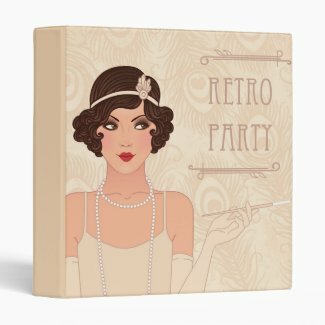 Here's a grand selection of 1920's Party Invitations from Zazzle that are sure to stir up some excitement in your guests. Each invite is fully customizable and comes with an envelope. These 1920's style invites are perfect for your flapper party. Just add your own details such as party type, address and what to bring. Just don't forget your pearls and boa! These cool Art Deco Bridal Shower invitations are super neat. Pair them up with the "Purse Game" for a fun 1920's themed party. Have a fun girls night out with a 1920's Art Deco Bachelorette Party. These fun invite look super classy and you can even ask your guests to glam it up for your event. You can even pick up some of these cute gal pal stickers (see above) for your event. Just click on the sticker to order from Zazzle. Make sure your include all of your party details on the invite including time, date and address. Don't forget to pick up some gifts and prizes for your party!